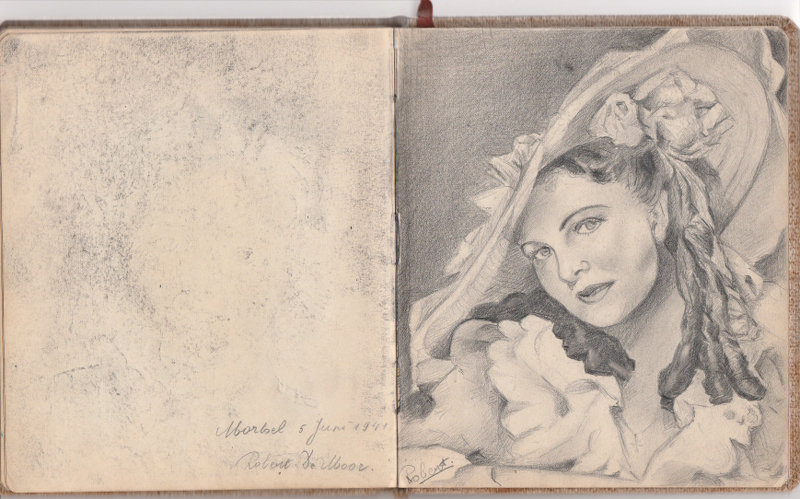 Bob De Moor, 15 years old, draws Vivien Leigh from ‘Gone with the Wind’ + class picture! 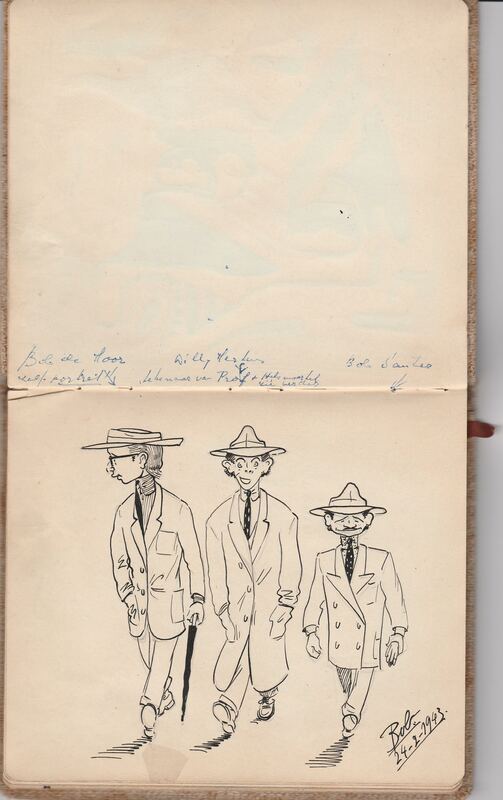 Yesterday you could read an article regarding a cartoon-esque drawing by Bob De Moor which was found in a notebook which belonged to the late Dutch-born Lily Schmutzer. 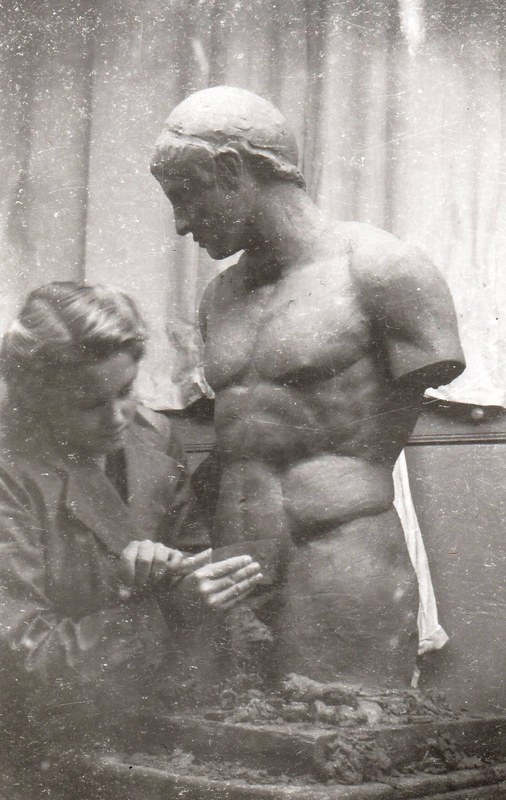 Schmutzer also followed drawing lessons at the ‘Academie voor Schone Kunsten’ from 1940 until 1945, just like Bob De Moor. Coincidentally, that very article revealed to Carine Weve that Bob De Moor was actually the same man as ‘Robert De Moor‘. 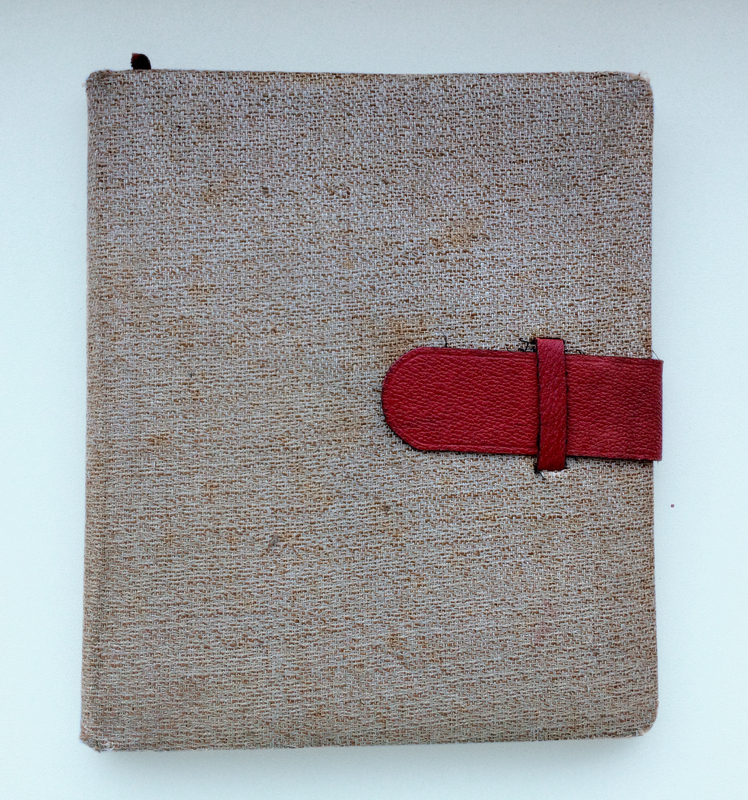 And behold, the notebook revealed some more De Moor material which never saw the light of day until today that is. The first is a drawing, which is dated June 5th 1941, and which was marked as being made in Mortsel, a community near Antwerp, where the family De Moor lived at that time (in the Jaak Blockxstraat 83 to be precise). It depicts – and this is a good guess – Vivien Leigh from “Gone with the Wind” (1939). The film itself only entered the Belgian cinemas in 1945, but it was by 1940 already a worldwide gossip phenomenon due to the main characters playing in the film. It was a sensational hit during the Blitz in London, opening in April 1940 and playing for four years… so it’s reasonable to think that also the Flemish gossip press was already talking about it. On top, De Moor was a Western fan – and “Gone with the Wind” did feature enough Western elements to interest him. 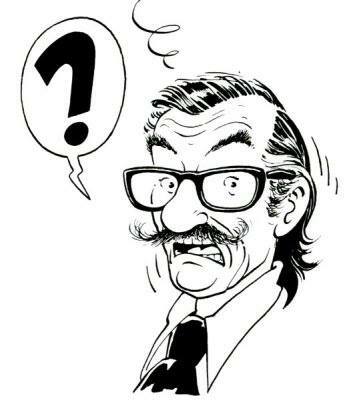 It’s highly possible he based the drawing on a photo in one of the gossip / trend magazines that existed around that time (or he saw it on a film poster). The then 15 year old Bob De Moor signs the drawing as ‘Robert‘. The drawing itself, is quite unique as we only know the cartoon-esque side from Bob De Moor during the period he studied at the Antwerp academy. You still see that he is not yet correctly mastering the sketching technique, the eyes are a bit hesitant and Leigh’s jaw is not correctly drawn. However, it does show that De Moor knew already well what lines made up a drawing, and the nose for instance is perfect, plus he has already well mastered the way to show the folds/shades in a blouse. This isn’t grand art, but it does represent a clear so far missing link between his drawings as a young child and his later drawings during his time at the academy. 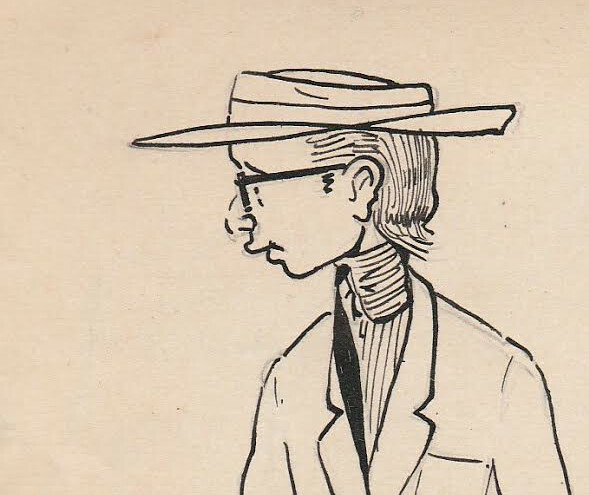 De Moor clearly preferred the publicity drawing lessons (1943) where he had to draw cartoon figures. The only portraits known from that time are actually more cartoon like than actual portraits. For those readers interested in details, on the left side you can see that the pencil strokes and shadows of the drawing have been partially rubbed over to the opposite page. The next item which popped up in Lily Schmutzer‘s notebook as “Robert De Moor” is a 8x6cm ‘big’ picture of the drawing class of 1940-1941. And who do we recognise there? Yep, a 15-year old Robert De Moor (nr. 7). The list of numbers with the corrseponding names is not included though, however, other pictures from around that time clearly show that nr. 7 is indeed Robert De Moor. 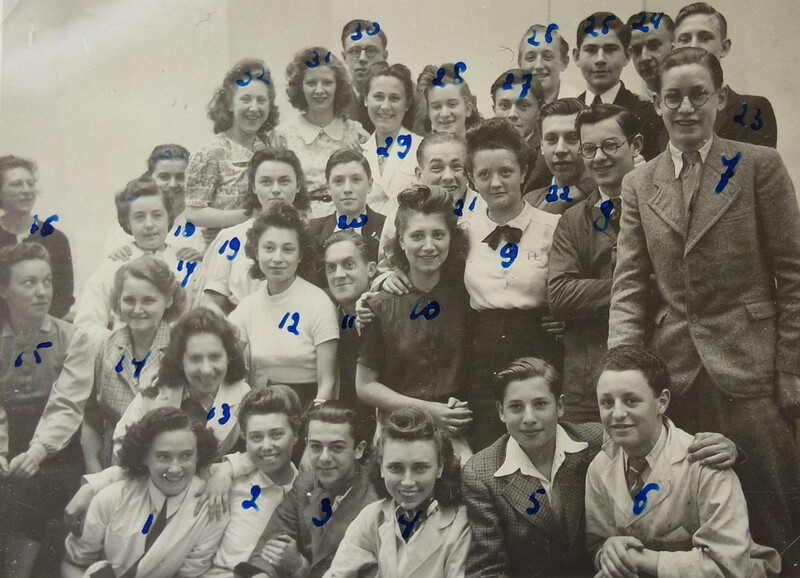 Lily Schmutzer is sitting on the left (nr. 14). She wrote the following text under the photo: “Voor ‘t eerst met de jongens samen in één klas, maakten we meteen een photo. We waren met een 60 tal. We maakten veel plezier, voerden niets uit maar ’t peil stond hoger als de hogere klassen.” (Literally translated, this reads like this: “We are sitting for the very first time together with the boys in one classroom, and immediately made a photo. We were roughly with 60 people. We had a lot of fun, didn’t do anything but the level was higher than the higher classes.”) The level refers to the quality of drawing. These 2 documents shed a new light on the early graphic career of Bob De Moor and have never been documented before. I want to thank fellow detective Carine Weve (again!) for the nice collaboration on getting this puzzle sorted out in just a few days!